Three years ago at the beginning of November I started a daily status on Facebook for something that I was thankful for. The challenge was to post a new/different “Thankful” each day of the month in honor of Thanksgiving. This practice has become very popular now on Facebook. Two years ago I started this Thanksgiving Thankfuls on my blog as a way for me to chronicle the blessings in my life, and for others to join me. This year instead of posting multiple posts either daily, weekly, or just when I got around to it, I decided to post the entire months worth of Thanksgiving Thankfuls all together. November 1st: Today I am thankful for the freedom to homeschool my children. Not every country allows such freedoms and we are blessed to live in the United States where it is legal in all 50 states. November 2nd: Today I am thankful for parent run organizations. They are more cost effective for our family, and the benefits of parent involvement are huge. We are appreciative of all the people who help to make both the Cobras Futbol Club and the Hilton Raiders Football organization a success. November 3rd: Today I am thankful for the availability of swimming lessons and recreation pools for the kids to swim in. Ava has a fear of the deep end, the filters, the lights, the bottom, etc. and it is helpful to keep her swimming on a regular basis, even through the winter. November 4th: Today I am thankful for Chloe’s home away from home – The Victors Gym. She has been at the gym since she was 3 years old. It is a sport she loves, and a second family to her. November 5th: Today I am thankful for my wonderful friend Cheri. She started doing my nails over 10 years ago when I was pregnant with Jayden. She is sweet, sincere, and selfless and not only the lady that does my nails, but a wonderful friend. November 6th: Election Day – Today I am thankful to live in a country where the people have the right and opportunity to vote. November 7th: Thankful to have the availability of dentists to care for our teeth, as well as insurance that at least covers some of the cost of this service. November 8th: Today I am thankful for my parents. Parents who have loved and supported not only me, but my husband and children as well. They have been a solid example for all of us. November 9th: Thankful for the three children I brought into this world. Each one of them has their own special traits that make them who they are. Chloe – my old soul, Jayden – my worrywort, and Ava – the one who proves parents don’t have all the control. November 10th: On this day of our Hilton Raiders Football banquet, I am thankful for the sense of community we have received throughout Jayden’s 5 years of playing in the organization. The countless hours that so many parents have spent there make it a program to be proud of, and one Joey is happy to be joining in the coming year as VP. November 11th: Today I am thankful for our “commune family”. It started 5 years ago when Joey met Ron in line at Hilton Raiders uniform sizing, and has continued ever since. From kid swaps, to family sleepovers the Cavuotos are an extension of our family. November 12th: Today and everyday I am thankful for our Veterans; past, present, and future, they fight for us, they fight so we can have the freedoms that we do. Thank you to all our Veterans. November 13th: My hair is cut and colored, and Chloe is happy once again. Today I am thankful for Georgie, the woman who has done my hair since my first perm in second grade. She is grounded, sincere, and giving, a woman most could only hope to become. November 14th: Thankful for Hip Homeschool Moms who took me on as a valued contributor and member of its team. I am lucky to have such a great homeschool support and resource in all of the wonderful ladies who make up the HHM team. November 15th: I couldn’t be more thankful for our wonderful friends, a family we consider to be part of our extended family, the Kinsler family. From many afternoons spent to hanging out, to road trips, water adventures, poker and more, they are a huge blessing in our lives. November 16th: There are no words for the depth of feeling I have for my husband, the other half of me. Today and everyday I am thankful for this man who is the half that makes me whole. November 17th: On busy days like today I am thankful for the quite days we get to spend at home. We have toned our schedule down some this year both during the day and in the evenings and I am enjoying the “sit still” time with my family. November 18th: I am thankful today for computer technology. So much of what we do in our homeschool is enhanced by the access to things we have via the computer. November 19th: Today I won a blog award – Best Super Homeschooler! So today I am thankful for the wonderful showing of love and support from family, friends, and many in the blogosphere for Starts At Eight. November 20th: My husband is so important that he gets two day this year! Only today I am thankful for the fantastic father he is to our children. He is the laughter that shakes in their bellies and the sunshine in their eyes. November 21st: Thanksgiving Eve – Today I am thankful for our home. The place which houses some of our most prized possessions, like our children. The place that contains our homeschool room. The place that gives us heat and shelter from the cold of winter. Our home which we knew from the moment we walked in was the place for us. 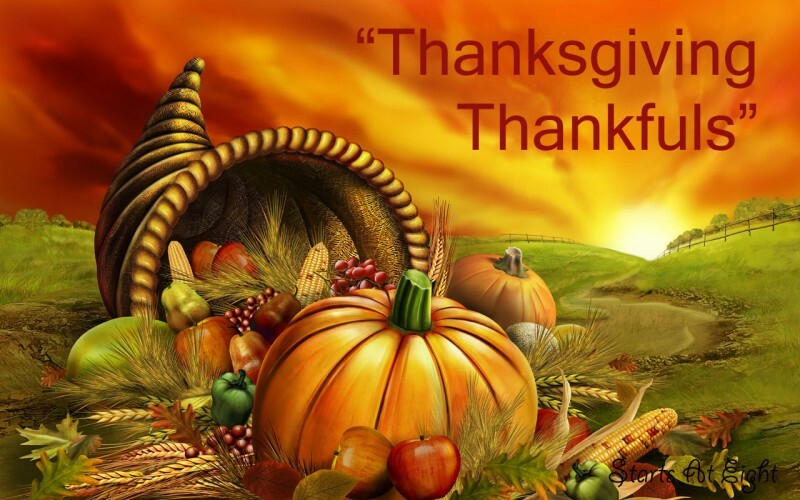 November 22nd: Thanksgiving Day: Today I am thankful for a holiday that reminds us to give thanks. It is too often we get caught up in the current of life and don’t stop to actually appreciate all that we do have. I am also thankful for the family and friends that are joining us at our Thanksgiving table this year. There are many things that I am thankful for that did not make this list. Most of the things on the above list stemmed from the occurrences of each of the days this month. Awe! 🙂 Nice thankful list.